Until now, I had to rack my brain to think of what instructional book to recommend for a student who wants to learn perspective. No longer. Scott Robertson's new book, "How to Draw: drawing and sketching objects and environments from your imagination " lays out all the principles and practices of drawing objects in perspective from your imagination. The emphasis is on how to draw things in perspective with traditional tools, but the principles apply to digital artists, too. The book begins with basic drawing materials and techniques, and then defines underlying concepts like cone of vision, viewing position, horizon line, and vanishing points, concepts that are often skipped over in other books. The book then goes on to explain exactly how to draw a form with compound curves—such as a car or an airplane—either from observation or imagination. The book, by Robertson's own publishing company Design Studio Press, is large (9x11 inches), thick (208 pages), and printed on good paper. The book also has innovative video content of the book that can be sourced by a URL inside and on an Android app that is still waiting on iOS approval. Scott is both a master teacher and a concept artist who has designed vehicles for many feature films. He has been working on this book for most of his professional career, and it benefits greatly from his experience as artist, teacher, and publisher. Other book recommendations in my "Survival Guide for Art Students"
Thanks for the info, I've been looking for a book like this for a long time! I got a lot of intuition from Ernest Norling's "Perspective Made Easy." I am curious about this one, now. I've been eagerly awaiting this post ever since you shared the video of Scott personalizing your copy. So glad you finally found that go to book to recommend to budding artists like myself! The clearest and most comprehensive treatment of perspective I've seen is Loomis' _Successful Drawing_. He details how to handle situations I've not seen in other texts, such as stairs in perspective. And he does it in his hallmark entertaining style. I'm eagerly waiting for this book to arrive at my house. Also another good source for learning perspective in depth is Erik Olson's perspective lectures at New Masters Academy. 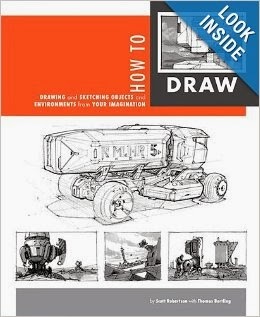 Does anyone know if this book includes information regarding drawing to scale? Any resource I find on the subject is generally vague or incomplete. Thanks. Sounds like a great addition to my library. Just ordered. Thanks for this recommendation. Scott is such an expert on sci fi vehicle concepts. Don't know if this answers your question ( I have not seen the book) but the Amazon link allows a look inside. The table of contents Chapter 4, pg 053 references transferring scale in perspective. There is no 'Homepage' as we generally think of one so it is odd to figure out at first. The 'page index' sidebar functions as links to its chapters, then at bottom of each page is link to next succeeding chapter. I find the book to be detailed but at the same time, complicated in some areas. Especially when Scott gets into the details of perspective and its terminologies I feel like I am reading a technical manual. But then again it can be my weak ability to grasp.